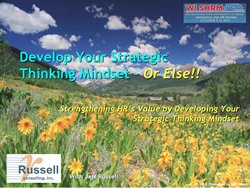 Fearless Reviews – Russell Consulting, Inc.
Fearless Performance Reviews - Jeff presented his powerful new framework for conducting truly fearless performance reviews at the Wisconsin State SHRM Conference and then to the Jefferson County HR Management Association and the Blackhawk Human Resource Association in Janesville. 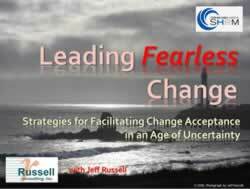 Click on the graphic above or here (Fearless Reviews) for a PDF version of the PowerPoint slides. Contact RCI for more information on our performance management workshops. Also, check out our book Fearless Performance Reviews!